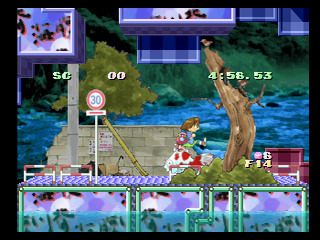 PSX Umihara Kawase Shun (JPN) in 02:18.75 by Samsara. Samsara improves the previous publication by 3.19 seconds, thanks to even further optimization. 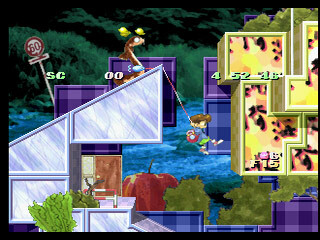 PSX Umihara Kawase Shun (JPN) in 02:21.94 by Samsara. While this movie by Samsara seems slower than the previous TAS, it is in fact faster by 516 frames in in-game time. 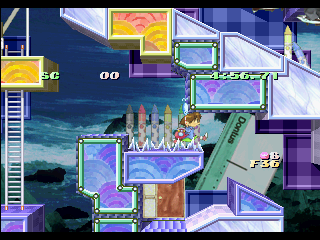 PSX Umihara Kawase Shun (JPN) in 02:10.23 by Mukki. This time, with the PlayStation's superior screen resolution, even more delicious fish can go across your screen at once as the author shoots through the game following the shortest known path. Currently 155 in-game frames faster than the published run: 129 in Field 0, 24 in Field 11, and 2 in Field 23. Still working on Field 23.